It’s hard to miss the four-story high, industrial building as you walk down West Lafayette Boulevard in Detroit, Michigan. Located just off the M-10 Lodge Expressway, the bookstore is nestled between Downtown Detroit, an area with museums, historical sites, and restaurants, and the West Side Industrial, a business district with apartments and condos lining the riverfront. Decorated with an enormous image of a glove, an image reminiscent of the original purpose of the building, both your curiosity and feet pull you through the front door of John K. King Used & Rare Books. As soon as you walk in, you’ll notice boxes of free books. Continuing up the stairs and into the distinct sections, you’ll notice that books cover every wall, every floor space of the store. The first floor consists mostly of books on Michigan, art, and classics, a selection of genres that will immediately draw in any kind of customer. John King Books isn’t simply a bookstore. It’s a destination for both tourists and residents of Michigan with a unique sense of “place” that can be found nowhere else here on the outskirts of Downtown Detroit. 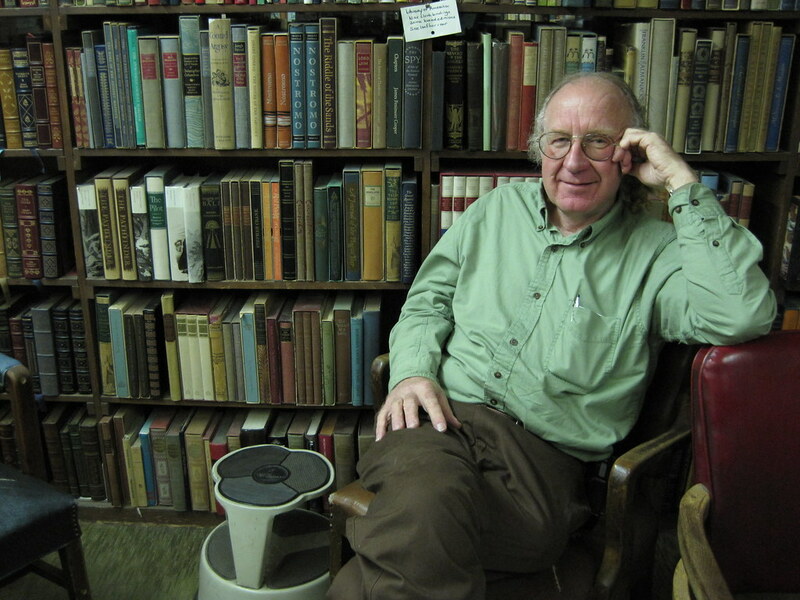 John King creates his bookstore’s “authentic sense of place” through the eclectic mix of books in his store. Here is where his visitors will find exactly what they didn’t know they needed – there is something for everyone. When we think “independent bookstore” we think “smallness…, being locally based, and limited in geographic scope,” visualizing a small bookstore with a collection that’s impressive in diversity but not size (Miller 165). We don’t picture John K. King Used & Rare Books. With four floors filled to the brim with books and a spare building for its rare books collection, John King Books is anything but small. A landmark in its own right, the bookstore gets a myriad of visitors. Both proud residents of Michigan and curious tourists walk in ready to find their next literary treasure. John K. King Used & Rare Books isn’t located in an area bustling with businesses; it’s fairly isolated on a street corner. Although the store’s website, and Google Maps, claims it’s in Downtown Detroit, some sources place the store in West Side Industrial, such as real estate websites Zillow and Trulia, as well as this map created by compiling various sources. Regardless of which neighborhood John King Books officially belongs to, the store acts as a bridge between the two neighborhoods. The West Side Industrial area immediately surrounding the store appears empty and devoid of culture, but John King Books is within walking distance of the museums, theaters, and art galleries in Downtown Detroit. You may choose to visit the downtown area to experience some culture, but once you get closer to the border between the two neighborhoods, John King Books is the only culture you’re going to get. John King Used & Rare Books doesn’t have the best relationship with the neighborhood in which it resides. King originally chose the location on West Lafayette because the building was large enough to hold his enormous book collection, but he didn’t seem to take the actual neighborhood into account. The books are what matter to King; the neighborhood is simply an afterthought. Most bookstores strive to be involved with the neighborhood surrounding their bookstore, but King takes a different approach. While he places those free books in the store’s lobby for people who can’t afford books, he otherwise doesn’t involve himself with the community surrounding the bookstore (May 3, 2016 interview). Aside from the specific neighborhood, King doesn’t even have an appreciation for Detroit itself. According to King, the city does not treat small business owners well, and it makes King’s work difficult. He told the Detroit Metro Times, “If I were going to start a bookstore in a major city, Detroit would not be on my list of cities to open—and not because of people, but because of the city.” Although Detroit may not be the most ideal location for a bookstore, King’s passion for bookselling keeps him at West Lafayette Boulevard. 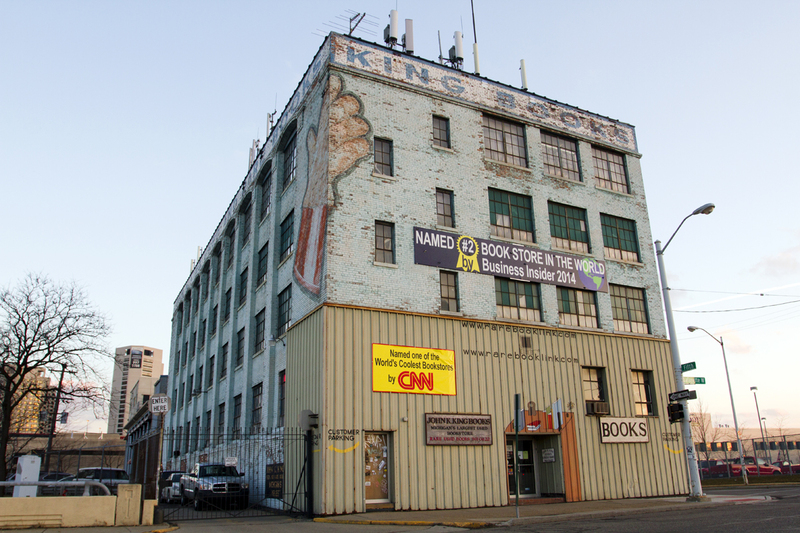 Despite King’s lack of involvement in the community, John K. King Used & Rare Books has grown into an icon of the West Side Industrial area, with its claims to fame as the second best bookstore in the world in 2014 according to Business Insider, and one of the world’s coolest bookstores in 2014 and 2015 according to CNN. John King Books isn’t the first bookstore to serve as a staple for the surrounding community, though. Before West Side Industrial there was Corktown, and before John King there was Ethel Claes. Back in the 1950’s, neighboring residential area Corktown encompassed the present-day West Side Industrial district. It was during this time period that Detroit city planners decided to convert part of Corktown into a light industrial zone. A woman named Ethel Claes stepped up to rally the residents of Corktown and fight for their homes. Claes ran a bookstore called The B.C. Claes Book Shop out of her Victorian home with the help of her mother, Hilja. While the shop had previously been known as a popular stop for Midwest rare book collectors, it was now known among the Corktown community as a “rallying point” for the fight against city planners. As can be seen today, the Corktown residents failed to save the 75 acres of residences that were bulldozed and replaced with West Side Industrial. Claes’s leadership and spirit can still be credited with preventing the loss of even more land and preserving what now makes up Corktown today. John King Books has replaced The B.C. Claes Book Shop as Corktown/West Side Industrial’s local literary gathering place. While it may not be the center of a significant fight against the city, the store’s identity as a spiritual descendant of Ethel Claes can be easily seen as it brings people together from both within West Side Industrial and outside the area’s boundaries. Since it is located in a light industrial zone, there aren’t really any residents for John King Books to fight for, unless you go down to the Riverfront apartments. West Side Industrial today is vastly different from Claes’s Corktown of fifty years ago. It can then be assumed that a vast majority of visitors to the store come from outside to West Side Industrial, and they’re coming to the area with John King Books as their destination, not the neighborhood. “Space” is acknowledged as being innately present in all areas of reality, but it is up to us as humans to assign significance and establish “place” (Cresswell 11). John King Books has carved out its own little “place” in the insignificant “space” of West Side Industrial thanks to the patrons it draws to its doors. Now let’s take a look at the history of the store itself. King’s business hasn’t always operated out of the dilapidated factory it’s known for today, and his bookstore actually led a pretty mobile life in the beginning. Initially established in Dearborn, Michigan (1971), John K. King Used & Rare Books only operated for a few years before packing up and shipping out to the Michigan Theatre Building (1977) in Downtown Detroit. Unfortunately, this new location didn’t last long, either, as the store’s growing book collection demanded more room. 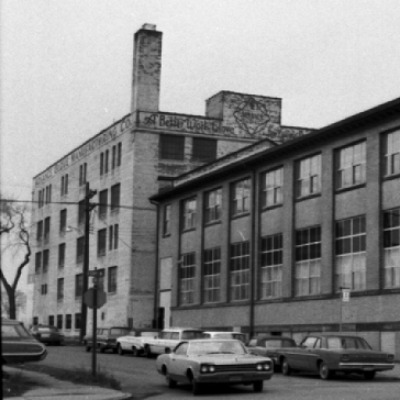 When the Advance Glove factory building at 901 West Lafayette came up for sale in 1983, King didn’t hesitate to purchase the four-story complex for his expanding bookstore venture. 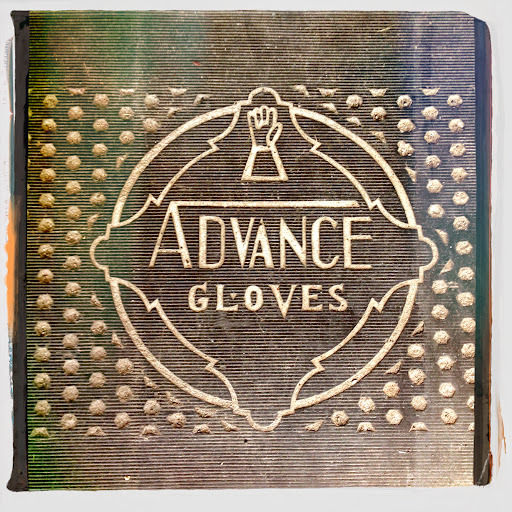 Now in 2016, John K. King Used & Rare Books is still conducting business from the same glove factory, and King himself now has various awards in honor of his bookstore. Knowing the history of John King Books is insightful into King’s business, but that sense of “place” is what truly helps you understand its impact on the bookstore. “Place, in whatever guise, is like space and time, a social construct” (Cresswell 57). 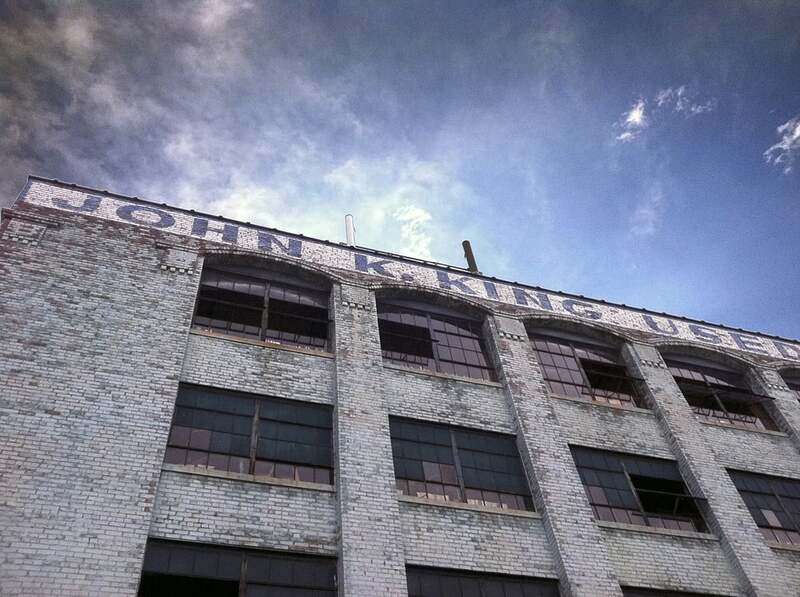 When you take the opportunity to look at John King Books’s place within the industrial district of Detroit as a social construct, you begin to see the outside influences that define it. While the physical location of the building certainly makes a difference, the social workings of the surrounding area largely affect how we perceive John King’s bookstore. When you juxtapose what is essentially the only major independent bookstore in the area outside Downtown Detroit, you get an idea of how vital this store is to the distribution of literature in the area. This outlet of books is really the only resource available to local residents looking to satiate their literary curiosities. The ownership of John King Used & Rare Books has been consistent over the many years it has been in business. Today, John King represents the store behind him. He is passionate about the collection of books in his store. “Every passion borders on the chaotic, but the collector’s passion borders on the chaos of memories” (Benjamin 60). King’s store certainly appears chaotic, and this chaos can also be seen in King’s personality. In interviews, King isn’t forthcoming about specific dates in the store’s history; he doesn’t seem to keep track of when the store started and when it moved. So what does King remember? King recalls his childhood, which he spent exploring used bookstores in Detroit. He was attracted to the stuff inside the bookstores: both the books and the “various characters” he met (Detroit Metro Times). From a young age, King had a passion for used bookstores, so it seems only natural that he decided to open his own store as an adult. King also recalls the estates where he acquired the stock for his store. When he gets a call from a lawyer or an heir offering up an estate to be sold, he buys what he thinks he can sell, transferring ownership of the specific collection. “Ownership is the most intimate relationship that one can have to objects” and the collector lives in those objects (Benjamin 67). When King acquires books for his store, he establishes this intimate relationship. The store’s shelves hold King’s personal collection, the books he deems worthy of stocking, and his presence is alive in the store. John K. King Used & Rare Books is a reflection of King’s tastes and tendencies. It’s a little disorganized and scattered, but full of valuable books. And, with the store named after him, it’s no surprise to discover that King is an active member of the store’s own little community. He works in the store consistently, spending his days buying books, arguing with people, and discussing literature (May 3, 2016 interview). He is a recognizable figure in the store as the owner of the large collection that fill the store’s four floors. This independent bookstore boasts an incredible amount of variety within that ever expansive stock. While you won’t have any difficulties finding your classics or historical accounts, you would also be hard-pressed to find a subject not covered somewhere within this plethora of books. All of these different genres coming together to compose an overall organized layout is the pure epitome of order and disorder. The nature of the collector forms a “dialectical tension between the poles of disorder and order” (Benjamin 60). To an outside spectator, the arrangement of books in John King Books may seem like nothing more than chaos, but in the right eyes, his bookstore maintains perfect order. As you observe the contents contained on each floor of John K. King Used & Rare Books, you’ll notice a trend as you ascend the building. Though the material covered in the books of the ground floor is conventional, an obscurity of genre is gradually explored as you go up each level. By the time you actually reach the top floor of King’s bookstore, you’re confronted with literature pertaining to odd topics, like alternative medicine and the Kennedy family. It’s hard to see the logic and reasoning behind this array of literature, but John King does have a method to the madness. Even if you are unable to understand the order in the store’s disorder, the bookstore is still fulfilling its greater purpose. By hosting this wide selection of literary genres, King is not only providing his customers with variety, but connecting them to worlds they would have never imagined. While some people think “literature” is only restricted to the classics like Charles Dickens or Walt Whitman, John King and his bookstore suggest that the term “literature” can be applied to all writing. The store’s layout only places emphasis on certain genres from a business point of view by placing the more popular genres like Michigan history and juvenile literature on the first floor. The rare book room housed in the second building also places more monetary value on the physical books but not necessarily on the words they contain. Fiction and non-fiction are mixed together on each one of the store’s four floors, and the store shows no shame in selling everything from True Crime to Civil War to Classics to Self Help books. The website for the store’s rare book catalog claims: “We are particularly interested in books concerning Military History, Michigan and Detroit, the Auto Industry, Signed books, First Editions, Stationary[,] Steam Engineering, Bible Reference, Chess and Checkers, Slight-of-Hand Magic, Incunabula and Early Printings, etc.” The store seeks to offer customers a myriad of genres, while still helping them find something they can’t find anywhere else. There are little to no restrictions on genre or form of writing for the literature sold at John K. King Rare & Used Books. John King Books presents itself as a place where people can get lost in literature. Customers are encouraged to lose themselves in the stacks, browsing every shadowy corner with minimal employee interference. The top three floors each have a telephone that customers can use to call an employee for assistance, a necessary fixture since the store doesn’t have any employees wandering among the stacks hoping to help. John King Used & Rare Books is a store where you can stay for an extended period of time; it’s not a store where you can easily just pop in and out with your book. The store is an inviting oasis, a safe haven for those who love books. Since John King Books doesn’t use computers to inventory the stock, customers can’t request for a bookseller to simply look up a title or author digitally. Without this digital crutch that so many bookstores have become accustomed to, customers and booksellers alike have no choice but to wander through the stacks and search for their request themselves. The store’s large and diverse collection offers you the chance to find not just the perfect book for your needs, but also yourself. You might fear that the changing techniques used by booksellers to rack up profits will drive John King Used & Rare Books out of business, but the owner isn’t worried. “We were here before Borders, we were here during Borders, and we’re here after Borders,” King told the Detroit Metro Times. The store has proven itself capable of surviving the shifting technology of bookstores, and it if can outlast a successful chain store and the shifting political climate of Detroit, then the store doesn’t seem to be going anywhere anytime soon. One strength the bookstore has that allows it to survive is its international presence. King is proud of the fact that he ships books all over the world, which illustrates the store’s desire to be more than a community bookstore. John K. King Used & Rare Books doesn’t strive to provide literature to locals; it strives to provide literature to readers, wherever they may be located. As King says, “we’re not a community bookstore, we’re a destination bookstore” (May 3, 2016 interview). John K. King’s Used & Rare Books Website. Rarebooklink.com. DeVito, Lee. “John K. King Used & Rare Books.” Metrotimes.com. 2014. John K. King Used & Rare Books Official Website. Kingbooksdetroit.com. Szewczyk, Paul. “Corktown History.” Corktownhistory.blogspot.com. 2014. 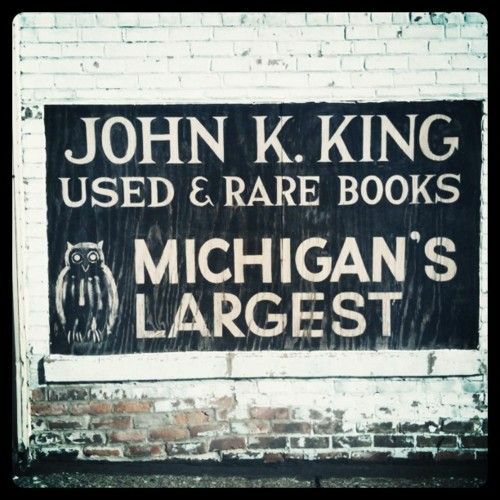 “John K. King Used & Rare Books.” GoogleMaps. 2016. “John K. King Used & Rare Books History.” TimeToast. 2016. “John K. King Used & Rare Books.” ThingLink. 2016. “Literary Tourist: John K. King Used and Rare Books, Detroit.” YouTube.com. 2012. “W Lafayette Blvd” GoogleMaps. 2016.